Well I’m pleased to say I’m now up to date on one of my quilt-alongs! I’m doing three at the moment, I know, probably a bit excessive! One of them is just a 16″ block once a month, it’s organised by Pat Sloan and it’s called ‘My Secret Garden‘ I’m stitching mine in mainly purples and greens with a touch of creamy gold. I’ve stitched two blocks in two evenings. I have to say the pieces seem ENORMOUS after Splendid Sampler ones, I’ve sort of got used to stitching 1.5″ squares and 2″ squares, to start cutting 5″ squares is quite a change!! One of the blocks involved making twelve pin wheels, my heart does still sink a bit when I read cut 24 squares, I rather like just doing small quantities! 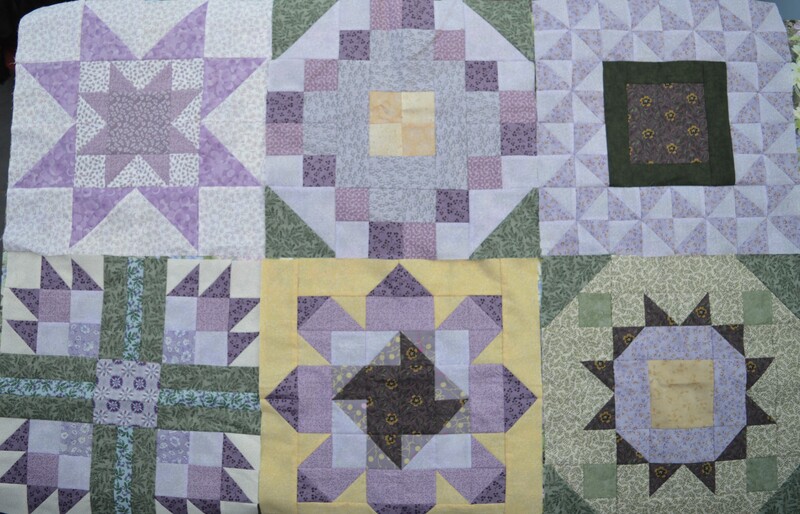 My quilting has improved a lot since I started Splendid Sampler, I’ve learnt such a lot, all my pinwheel seams are furled and I’m pretty pleased with the result, they all lie nice and flat at the centre. 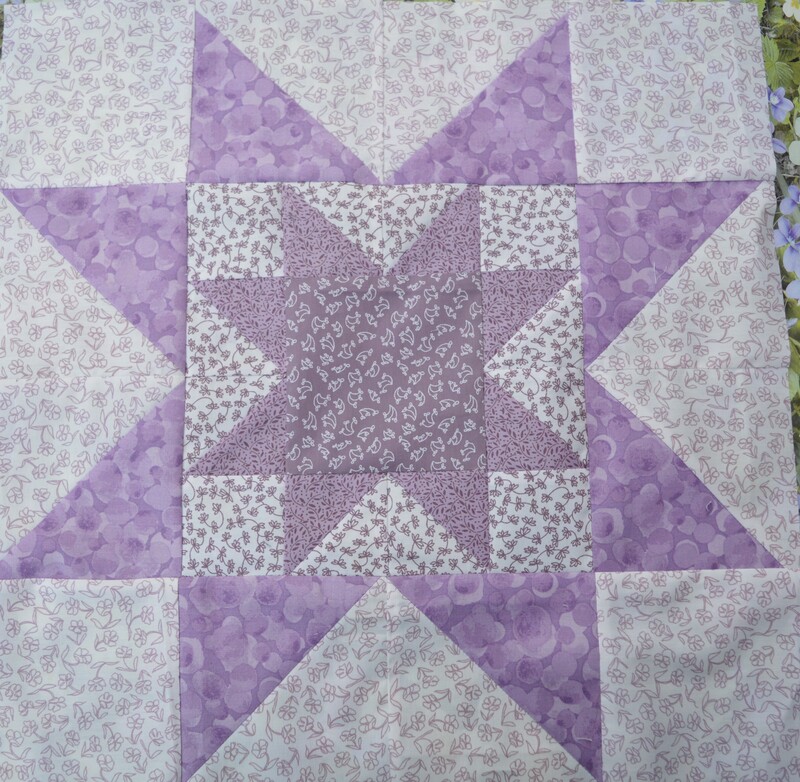 The second block was a double star, I rather fancy making a star quilt next time with lots of different star blocks, especially now my points have improved! I wasn’t sure about my colour and pattern choices at first with these two blocks, I felt the first block was too dark in the middle and the second one was a bit too bitty and too purple! I’ve made six blocks now out of nine, so I put them all together and actually I think they look ok. It was a useful exersize arranging them like this as I can see I need to use a bit of cream and more green in the next ones to help balance it out. I just wasn’t happy with it and I still had the comb to do! After much deliberating I’ve decided to use bondaweb and blanket-stitch, I like the effect when I’ve used it in the Splendid Sampler and it’s not like this one’s going to get washed regularly. I started on month three to see how it went. Two little pigs and a tractor, in two short evenings it was finished. I’ll go back and redo the cockerel with bondaweb at some point but I’m happier with it. It’s one of the situations when it’s better to finish in a different way than not at all! 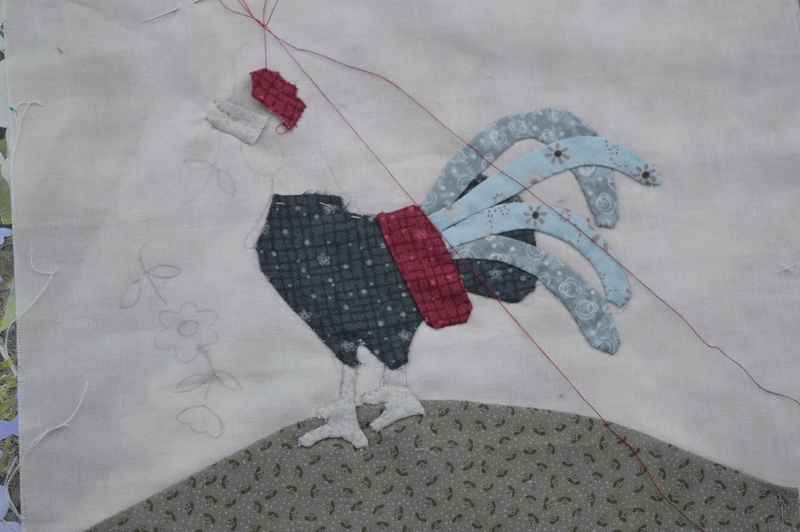 I’m linking up with Kathy’s Quilts for Slow Stitching Sunday and Super Mom No Cape for Vintage Embroidery Monday, why not have a look what every one else is hand-stitching. 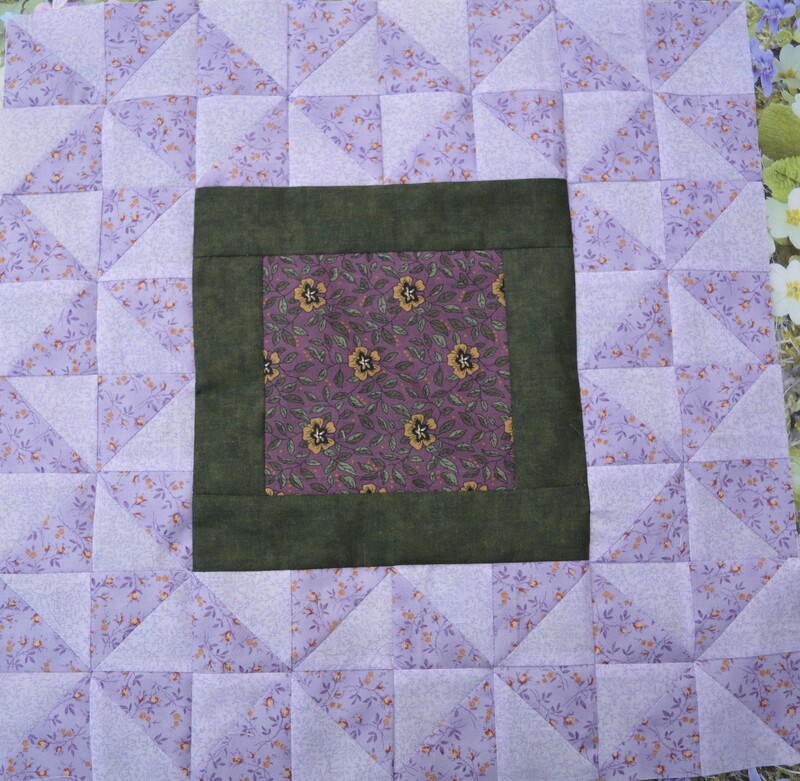 This entry was posted in Quilting, Serendipity and tagged My Secret Garden, Quilting. Bookmark the permalink. Thanks, that quote is so me when it comes to fabric!! There are some really pretty blocks in this post and oh my those little pigs are just too cute!! Wow! The blocks look fab. Thanks, I’m definitely making progress! I love that pinwheel block. Your seams and points are just beautiful. All of those blocks are very pretty. The little pigs are adorable. What a cute block. I can’t believe you are attempting 3 BOMs at once. I have yet to attempt one. I think three at once may have been pushing it! I’ve only 3 months to go on one of them!! Wonderful progress on great projects, love those pigs. The pig and tractor block is a cute one. One of my favorite quotes and so apt to us fabric hounds that can’t resist so much as a fat quarter, or at least this quilter can’t. I love the Secret Garden blocks, the colors are great. The pig and tractor block is cute I would have done the same thing with the Cockerel better to have the finished block than none at all. WOW that is a lot of BOMs to keep up with. Especially the Lynn Anderson one! I do like that two pigs and a tractor block though! Thanks so much for linking up to last week’s Stitchery Link Party and the link back. Aloha hugs!